During the dark days of California’s recent budget crisis, state policymakers had to make very tough choices about which critical public services to cut, and by how much. At the time, there was a general expectation around the state Capitol — and throughout California — that as the economy improved and revenues came back, policymakers would undo some or all of the reductions that they imposed during and following the Great Recession. While lawmakers and the Governor have begun to reinvest in important services and systems over the past couple of years, some key programs remain on the chopping block despite a growing state economy and higher revenues. This list includes one of California’s most important public supports for seniors and people with disabilities: SSI/SSP (the Supplemental Security Income/State Supplementary Payment program). SSI/SSP uses both federal (SSI) and state (SSP) dollars to provide modest monthly grants that are intended to help 1.3 million low-income Californians keep a roof over their heads and purchase food and other basic necessities. We described the state’s recession-era cuts to SSI/SSP cash assistance in a previous blog post. The bottom line is that state policymakers cut California’s portion of the grant from $568 to $396 for couples and from $233 to $156 for individuals. As a result, the maximum grant for individuals — currently $889 per month, including the federal SSI grant — amounts to just 90 percent of the federal poverty line. (In 2015, the poverty line for an individual is $11,770, or roughly $980 per month.) These state cuts undoubtedly increased hardship for vulnerable seniors and people with disabilities. Yet, they remain in place today, and the Governor proposes to maintain the state’s SSP grants at their current levels in 2015-16, the fiscal year that begins this coming July 1. While the significant human cost of the state’s cuts to SSI/SSP grants is impossible to quantify, we can assess the impact on the state budget. 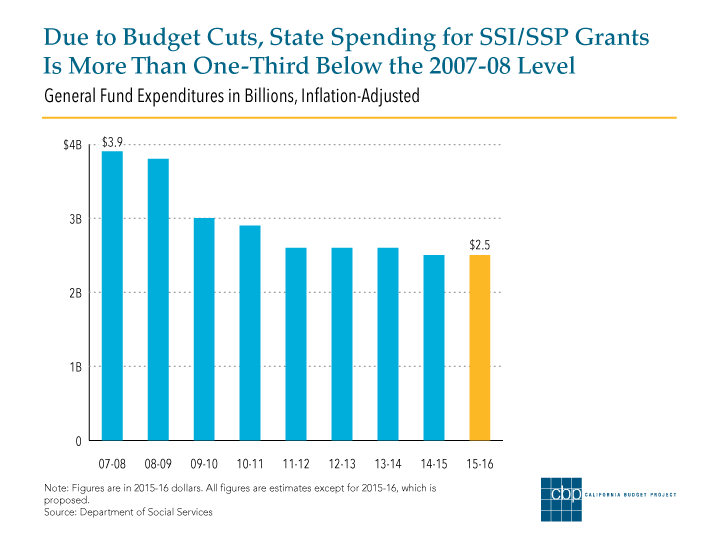 These cuts substantially lowered state support for SSI/SSP, as shown in the following chart. In 2007-08, the year the Great Recession began in California, the state spent about $3.9 billion for its share of SSI/SSP cash assistance, after adjusting for inflation. The Governor proposes to spend $2.5 billion on SSI/SSP grants in 2015-16, more than one-third below the 2007-08 level. In other words, after taking into account the cost of living, the state is providing $1.4 billion less for SSI/SSP grants than it spent on the eve of the Great Recession — and this despite the fact that the number of Californians enrolled in SSI/SSP has risen by more than 5 percent since 2007-08. So, when the Governor forecasts balanced state budgets for the next few years, it’s important to keep in mind that this promising fiscal scenario rests on a troubling assumption: that state policymakers will leave in place the recession-era cuts to SSI/SSP grants, perhaps permanently. Put another way, the Governor’s proposed budget is built on well over $1 billion in annual state “savings” that come from reducing a critical source of basic income for more than 1 million of the state’s most vulnerable residents. As this year’s state budget debate heats up, state lawmakers — and all Californians — should ask themselves if this is the kind of “fiscal prudence” they bargained for. One in seven Americans had trouble affording enough food in 2013, according to federal data released earlier this year. Among seniors 65 and older, 8.7 percent were food insecure nationwide. Yet, seniors are less likely than other demographic groups to participate in the federally funded Supplemental Nutrition Assistance Program (SNAP). 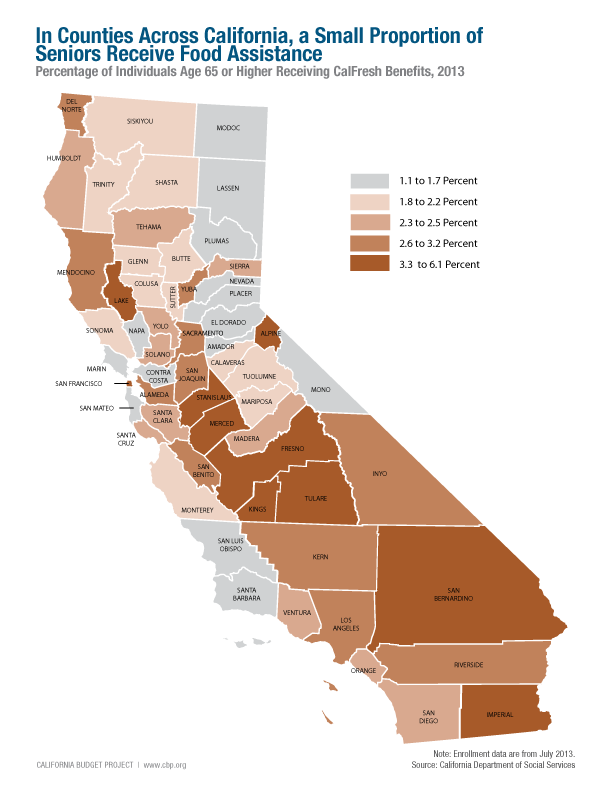 In this post, we examine county-by-county trends in food assistance for California seniors, a strikingly small share of whom receive CalFresh — California’s version of SNAP. (See map below for seniors’ CalFresh participation by county.) In previous blog posts, we looked at county-by-county enrollment in CalFresh for the overall population and for children specifically. Seniors enroll in CalFresh at rates that are strikingly low compared with their poverty rate. Statewide, 10.4 percent of California seniors lived below the poverty line in 2013, and a 2011 survey that found that 9.5 percent of California seniors were food insecure. However, only 2.6 percent of seniors in California participate in CalFresh. One big reason for the discrepancy between food insecurity among seniors and their receipt of food assistance is this: California is the only state in which recipients of Social Security Income/State Supplementary Payment (SSI/SSP) grants are not eligible for SNAP. This state policy has been in place since 1974, the beginning of the SSI/SSP program. Initially, California’s SSI/SSP grants were generous enough that recipients were eligible only for the minimum SNAP benefit of $10. To ease the paperwork burden, the state implemented a “cash-out,” which provided a few extra dollars in the SSI/SSP grant for food. However, the overall SSI/SSP grant has failed to keep pace with inflation, and the maximum grant for an individual is now below the federal poverty line. About a third of the state’s SSI/SSP recipients are seniors; the rest are people with disabilities. Unfortunately, simply ending cash-out in order to make seniors eligible for CalFresh is also likely to decrease benefits for families living with a person with disabilities, families who are particularly vulnerable to poverty and food insecurity. Policymakers can ease food insecurity and help seniors and other vulnerable Californians by investing in SSI/SSP to gradually bring grants above the poverty line. They could also index the grants to inflation to prevent further erosion. Among seniors who aren’t enrolled in SSI/SSP but whose incomes are low enough to qualify for food assistance, some may believe that the minimum CalFresh benefit for which they may qualify — $15 per month — is not worth the paperwork, while others may be embarrassed about receiving public assistance. This is why counties are concentrating on targeted outreach strategies, such as ad campaigns that focus on seniors and screening events at senior centers. Clearly, there is much to be done to help California seniors access CalFresh. Good nutrition and reliable access to food are among the most important preventive care strategies for diabetes and heart disease. Seniors who have trouble putting food on the table are about 50 percent more likely to report a heart attack or develop asthma, and are 60 percent more likely to experience depression, compared to seniors who have adequate access to food. Broadening the reach of CalFresh can keep California’s seniors healthier while helping them avoid having to choose between paying for food and paying rent, medicine and other necessities.